Ethnobotanical Leaflets 14: 826-35. 2010. Urginea grandiflora Bak. and Pancratium tortuosum Herbert are bulbous, medicinal plants endemic to the Sudan. The aim of this study was to provide information on the anatomical properties of the leaves and roots of these two bulbous plants. Anatomical studies include cross sections of the leaves and roots. In addition, phytochemical screening methods were applied for identifying the major chemical groups in these species. This study provides referential botanical and phytochemical information for correct identification of these plants. Key words: bulbous plants; Urginea grandiflora; Pancratium tortuosum anatomy; phytochemistry. To ensure reproducible quality of herbal products, proper control of starting material is utmost essential. Thus in recent years there have been an emphasis in standardization of medicinal plants of therapeutic potential. According to World Health Organization (WHO) the macroscopic and microscopic description of a medicinal plant is the first step towards establishing its identity and purity and should be carried out before any tests are undertaken (Anonymous. 1996). Correct botanical identity based on the external morphology is possible when a complete plant specimen is available. Anatomical characters can also help the identification when morphological features are indistinct (David et al., 2008). Urginea grandiflora Bak. (Hyacinthaceae) and Pancratium tortuosum Herbert (Amaryllidaceae) are perennial, herbaceous and bulbous plants, distributed in the Red Sea Hills in Eastern Sudan (Andrews, 1956). The latex of U. grandiflora obtained directly from the bulb of the plant can be applied directly to cuts and wounds. The bulb of P. tortuosum is used as malaria therapy. Few studies have been devoted to these two species, therefore this work has aimed to investigate the leaf and root anatomy in order to contribute to the medicinal plant identification and to investigate their secondary metabolites content. Bulbs of the two plants were collected from Erkawit area in Eastern Sudan. The taxonomic identification of the two plants was carried out at the Herbarium of Botany Department, Faculty of Science, and University of Khartoum. Voucher specimens were deposited at the herbarium as reference materials. For anatomical analysis, fresh mature Leaves and roots were fixed in formalin: glacial acetic acid: 70% alcohol (5:5:90). Sections were prepared according to the method described by Alexander (1940). Transverse sections were prepared by using a rotatory microtome (Leitz 1512-West Germany) and stained with safranin. A light microscope was used to view the slides and adjusted to finest resolution. Photographs were obtained using a Nickkon digital camera focused through the microscope eyepiece. Qualitative analysis of chemical constituents was carried out according to the method described by Sofowara (1993. The root: Transverse section of the root appears as a complete circle Fig. (1a). The outer region is the bark covered with suberin and tannins. The epidermis consists of a single layer, followed by the hypodermis which consists of one raw of large cells. 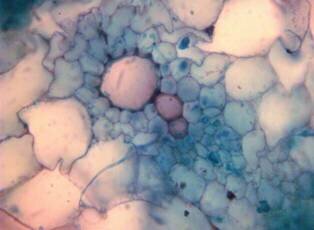 Inner to the hypodermis is the cortex which consists of 22-25 layers of parenchyma cells. The endodermis is the last layer of the cortex, formed from elongated very thin- walled cells.� One layer of the pericycle is found inner to the endodermis, followed by the typically alternating radial vascular bundles (15 � 17) arranged in a circle. 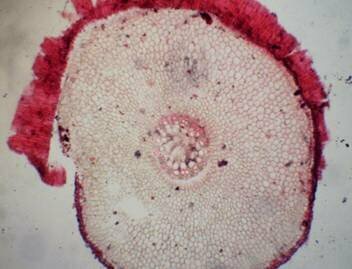 The vascular bundles are formed from phloem and xylem. 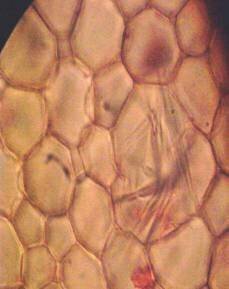 Phloem consists of sieve tube cells, companion cells and phloem parenchyma. Xylem consists of protoxylem vessels to the outside and metaxylem vessels to the inside connected by conjunctive tissue with the phloem. ����������� Although roots of monocotyledons commonly, lack normal secondary growth (Esau, 1977), abnormal secondary thickening is observed in U. grandiflora root. Large secondary vessels in a circle are observed inner to the primary xylem vessels Fig. (1b). Also abnormal secondary phloem is found alternating with the secondary vessels. Fibers are observed around the large secondary vessels. Calcium oxalate crystals appear in the cortex as clusters and single raphides (Fig.1c). Appearance and location of the crystals may be specific and useful in taxonomic classification (Kuster, 1956). 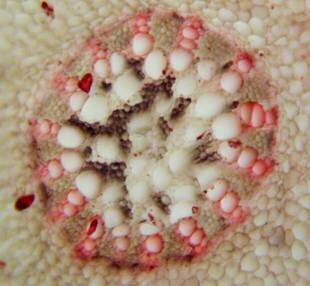 Few parenchyma cells form the pith at the centre. The leaf: Transverse section showed that, the leave is isobilateral, broad and dark green Fig (2a). The abaxial and adaxial epidermis consists of one raw of elongated cells covered with zigzagging (toothed) cuticle Fig. (2b), the cuticle is absent at the stomatal area. Sunken stomata are observed which is kidney-shaped in surface view. The mesophyll between upper and lower epidermis is not differentiated into palisade and spongy parenchyma. The cells inner to both epidermal layers are dense with chloroplasts (chlorenchyma cells). They are more regularly arranged than the central cells of the mesophyll. 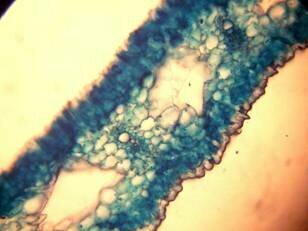 The central part consists of very large parenchyma cells with no chloroplast Fig (3a). Parallel vascular bundles (10 � 12) are distributed. Each collateral bundle consists of xylem and phloem. The xylem vessels towards the upper abaxial surface are found in two rows connected with parenchyma cells. The phloem consists of sieve tube cells and companion cells with few parenchymas Fig (2c). 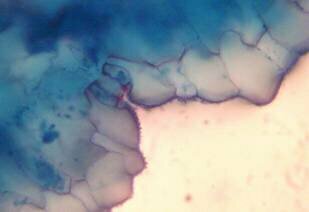 Starch granules are distributed in the mesophyll. Fibers are observed around the xylem vessels. The root: Transverse section of the root appears as complete circle Fig. (3a). 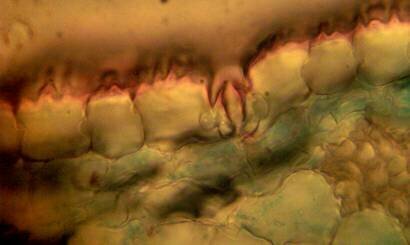 Suberized cells are found to the outside forming the bark, inner to the bark a single layer of epidermis followed by one layer of hypodermis. Inner to this 12 � 14 raws of large parenchyma cells of the cortex ended with endodermis. The endodermis is a single layer with very thin-walled cells. The pericycle is found as one layer in between the endodermis and the first protoxylem. Seven to eight radial vascular bundles are found in a circle. The xylem and the phloem are radially alternate. The xylem consists of protoxylem to the outside and metaxylem to the inside, phloem consists of sieve tube cells and companion cells. Formation of abnormal secondary thickening is observed with secondary vessels occupying all the central area. No pith is found Fig. (3b). The leaf: The leaf is isobilateral (Fig. 4a). The interesting character of this leaf is the twisting behavior. The twisting behavior may be a xerophytic character to reduce water loses by transpiration (Esau, 1977). The upper and lower epidermis each consist of one raw of elongated cells covered with toothed cuticle interrupted by the sunken stomata Fig. (4b). Surface view showed kidney-shaped stomata. 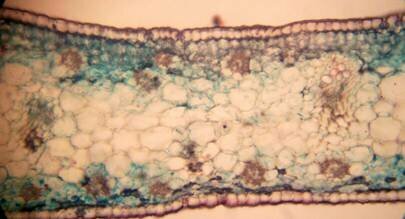 The mesophyll consists of 3-5 rows of irregular chlorenchyma cells dense with chloroplasts. 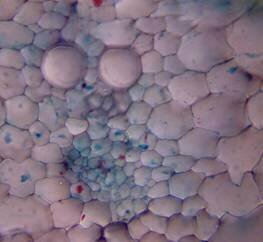 The central cells of the mesophyll are large parenchyma cells without chloroplasts. 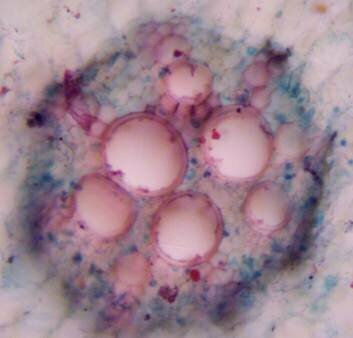 Very large thin-walled water storing parenchyma cells extending in the centre of the section alternating with the vascular bundles are observed Fig. (4a & c). 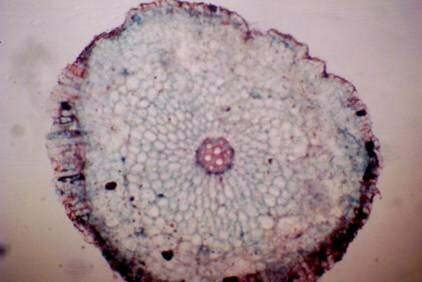 Vascular bundles are 16 in number, consisting of xylem and phloem and surrounded by parenchyma cells, but no sclerenchyma cells are found. The xylem consists of one raw of vessels with large metaxylem towards the upper epidermis. Phloem consists of sieve tube cells and companion cells Fig. (4c). Anatomically the presence of large water storing parenchyma cells in the mesophyll together with the very weak narrow vascular bundles and the absence of supportive tissues may facilitate the twisting behavior of the leaf to adapt the arid environment. The observed thick cuticle and sunken stomata are also xerophytic characters help to decrease the rate of transpiration (Esau, 1977). Phytochemical screening of secondary metabolites constituents of U. grandiflora and P. tortuosum bulbs was carried out. Results were summarized in Table (1). U. grandiflora is rich in alkaloids and cardiac glycosides. Also it revealed the presence of flavonoids, saponins, terpenes and steroids. P. tortuosum is also rich in alkaloids and showed the presence of cardiac glycosides, flavonoids, saponins, terpenes and steroids. Both bulbs were devoid of anthraquinones. Several studies showed that alkaloids (Fennel and van Staden, (2001); Berkov et al. (2003); Cedron et al. (2008)), cardiac glycosides (Kellerman et al. (1988); Kopp et al. (1996); Crouch et al. (2006)), terpenes (Chantal et al. (2005)) steroids and saponins (Burkill, 1985) are wildly spread in� Urginea and Pancratium genera. ++: high content; +: present;-: absent. This study could provide a good basis for the selection of Urginea grandiflora and Pancratium tortousum for further investigation in the potential discovery of new natural bioactive compounds. Andrews, F.W. 1950. The flowering plants of the Anglo-Egyptian Sudan, Vol.III, ��Buncle & Co.Ltd., Arbroath, Scotland. Anonymous. 1996. Indian Pharmacopoeia. Vol II. 4th ed. New Delhi: Controller of Publications, Government of India. Alexander, J.D. 1940. Plant Microtechnique. McGraw Hill, London 101-140. Berkov, S., Evstatieva, L. and Popov, S. 2003. Alkaloids in Bulgarian Pancratium maritimum L.Verlag der Z. Naturforsch. 59: 65�69. Burkill, H. M. 1985. The useful Plants of West Tropical Africa. Royal Botanic Gardens, Kew (K).55-64. Cedron, J, C., Oberti, J.C., Estevez-Braun, A., Ravelo, A.G., Aguilar, M.D.A. and Lopez, M. 2008. Pancratium canariense as an important source of Amaryllidaceae alkaloids. J. Nat. Prod. 3:87-91. Chantal, K., Dulcie, A. and Neil, R.C. 2005. Type of sesquiterpenoids from Urginea epigea. Biochemical systematic and ecology. 33: 295�299. Crouch, N.R, Dutoit, K., Mulholland, D.A. and Drewes, S.E. 2006. Natural product research group. school chemistry. University of Kwazulu-Natal, Durban 4041, South Africa 14:33-36. David F. Cutler, Ted Botha, Dennis Wm. Stevenson (2008). Plant Anatomy: An Applied Approach. Wiley-Blackwell. Esau, K. 1977. Anatomy of Seed Plants 2ed edition. Library of congress. Cataloging in publication 90-116. Fennel, C.W. and van Staden, J. 2001. Crinum species in traditional and modern medicine. J Ethnopharmacol. 78: 15�26. Kellerman, T.S., Coetzer, J.A.and Naude, T.W. 1988. Plant poisonings and Mycotoxicoses of livestock in Southern Africa. Oxford University Press, Capetown 16:199-200. Kopp, B., Krenn, L., Draxler, M., Hoyer, A., Terkola, R., Vallaster, P. and Robien, W. 1996. Bufadienolides from Urginia matitima from Egypt. Phytochemistry. 42: 513�522. Kuster, E. 1956. Die Pfllanzenzelle. 3rd ed. Jena, Gustav Fischer. Safoware, A. 1993. Medicine in Africa. Spectrum books. Ltd, Ibadan, Nigeria. 289p.